Think about morning. 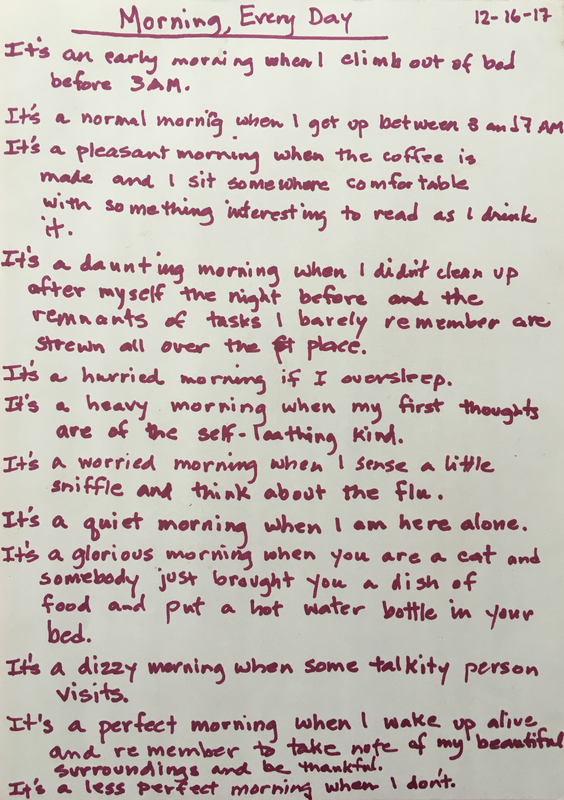 What is morning like for you? Does it arrive by the clock? Where does it fit in your sleeping and eating patterns? Are there things that you usually do in the morning? Interactions you usually have? Let your mind relax and recall what mornings can be like for you. It is a _________ morning when _________. 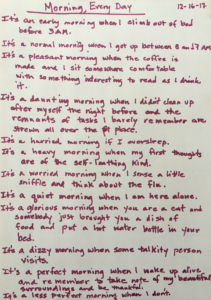 Fill in the first blank with the name of some kind of quality a morning could have, a word that answers, “What kind of morning?” Funny, tiresome, green, cold, noisy, unforgettable, thirsty… Whatever pops into your head. In the second blank, tell what would happen to give that quality to the morning. Keep using that pattern and fill up the page. Give it a title. Write the date on it somewhere.